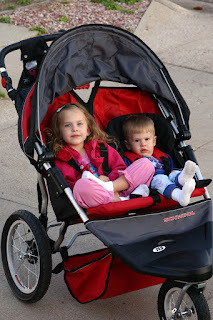 From our corner of the Good Life: New Jogging Stroller! 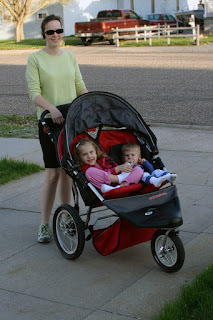 I've been enjoying my new double jogging stroller - almost every day since I got it! Since Jim has been working a few evenings a week, it's been a good time to head out for a walk, sometimes to the park. If we take the "long way around", we can take the trail to the park, and that makes a good uphill/downhill workout for me! Tonight, I decided we'd go for a bedtime walk since the kids already had their bath. We headed out on the trail but cut back home before they saw the park and wanted to play! That looks like a lot of fun...for all of you!